Once the also-ran among Halloween Theme Parks in Los Angeles, Six Flags Magic Mountain Fright Fest is now a major contender, with more scare zones, improved mazes, impressive production values, and amazing monsters – not to mention the park’s extensive variety of high-thrill roller-coasters. 2018 Hours: Park is open 10:30am to midnight on Fridays and Saturdays, 10:30am to 11:00pm on Sundays; Fright Fest begins at 7:00pm. 2018 Mazes: Condemned: Forever Damned (new); Sewer of Souls (new); Hell Fest (new); Aftermath 2: Chaos Rising; Willoughby's Resurrected; Red's Revenge. 2018 Scare Zones: The Shadows (new); Witches Lair (new); City Under Seige; TERRORtory Twisted; Demon's Door; Exhile Hill; Nightmares: A Twisted Fantasy. 2018 Entertainment: Voodoo Nights (DJs and dancing); High Sierra Hypnotist. Tickets: Season Admission passes start at $94.99. Daily admission starts at $53.99 for advance sales. Maze passes start at $18; Express Maze passes start at $33. A "Daily Admission plus Maze Pass" option is "coming soon." Unlike the Knott's Halloween Haunt, Six Flags Magic Mountain Fright Fest does not close in the evening and re-open at night in its haunted version. During the day there are family-friendly events such as pumpkin carving, trick-or-treating, costume parties and photo ops with Looney Tunes characters. After dark, there are dance parties, music, and magic shows, in additional to mazes and scare zones. A general admission ticket allows visitors to enjoy roller-coasters by day and Halloween horror by night, although admission to the mazes requires an extra fee for a wrist band. The Halloween scares are not limited to the walk-through mazes. There are ghouls roaming free in several areas of the park. The usual Six Flags Magic Mountain rides will be altered for Halloween, running backwards or in the dark. In years past, Six Flags Magic Mountain took a "business as usual" approach to its annual Halloween event, which was essentially a value-added seasonal overlay - the regular park with little decoration, just a handful of mazes, plus a couple of scare zones and shows. The advantage was that visitors could enjoy the regular rides and the Halloween attractions for a single ticket price. In 2008, Six Flags Magic Mountain Fright Fest began charging an additional fee for its walk-through mazes - a sign that it was taking the season more seriously and offering customers more for their money. 2011 saw Six Flags Magic Mountain actively trumpeting Fright Fest in no uncertain terms. 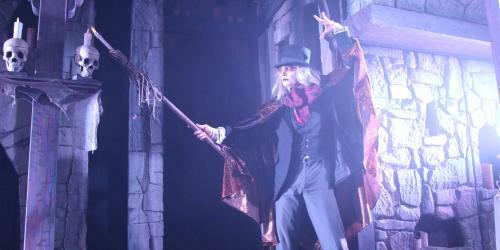 Offering "thrills by day" and "frights by night," the 2011 incarnation emphasized adult scares instead of the family-friendly aspect highlighted during previous seasons. By 2014, Fright Fest had reached the point where it could stand comfortably shoulder-to-shoulder with other Halloween Theme Parks, thanks to such impressive mazes as Willoughby's Resurrected, Aftermath: Chaos Rising, and Red's Revenge. Since then, the Halloween aspect has been visible throughout Magic Mountain, with more decorations and numerous scare zones throughout the park. Makeup and production values are much improved, in some cases rivaling those of Halloween Horror Nights at Universal Studios Hollywood. These mazes and rides were offered in year's past. Warehouse 13 - The ultimate test of bravery is at the toxic warehouse where employees are less than happy about seeing visitors. Be forewarned, work is mandatory and escape impossible. Not recommended for children under 12. Foggy Nights - Batman the Ride goes upside down and inside out when a notorious Gotham villain releases toxins into the air.  Lecter's Slaughterhouse. Step on these deadly docks and enter the world of the celebrity butcher taking wretched revenge on the bowels of society. Jokester's Hide out 3D. Sneak through an all black-light hideout and catch a 3D peek of the funny projects on which the Jokester and his crew are working. But watch your back…sideshow clowns run amuck! Children under 12 are allowed to wear Halloween costumes. You have to drive to Valencia. Six Flags Magic Mountain closes relatively early -- at 10:00pm. Most of the Halloween attractions do no open until 5:30 or 6:30pm; consequently, even if you finish with the roller-coasters by dark, long lines can still make it difficult, even impossible, to get into all the haunted mazes during the evening. Typically, the mazes are filled with brightly uniformed park staff helpfull pointing you in the right direction; their presence often undermines the atmosphere.